At the BAA Field, X-Road’s dream start to the season continued with a 4 – 0 win over BAA. Donavan Thompson gave X-Roads a 2 - 0 in the first half, and then second half single strikes from Jahron Dickinson and Jamin Furbert made the final score 4 – 0. At the PHC Stadium a 40th minute strike from the penalty spot by Cecoy Robinson gave the PHC Zebras a 1 – 0 win over the North Village Rams. The Paget Lions picked up their first win of the season in the Premier Division as they traveled to Lord’s in St. David’s and defeated the Boulevard Blazers 4 – 1. Dion Stovell would score twice, while Sergio Richardson and Trey Saunders added a goal each, Ernest Trott scored the lone goal for the Boulevard Blazers. At the Devonshire Recreation Club, the Devonshire Cougars defeated the Somerset Trojans 3 – 1. The Devonshire Cougars would get single strikes from Mark Steede, Shakii Pearman and Jomeko Mallory, while Justin Corday scored the lone goal for the Somerset Trojans. At the BAA Field the Flanagan’s Onions and Somerset Eagles played to a 1 – 1 draw, Anwar Telford opened the scoring for the Somerset Eagles in the 25th minute, but the Flanagan’s Onions would find the equalizer in the 90th minute when Jahvon Morgan’s shot went in off the underside of the crossbar. Visiting Hamilton Parish defeated Ireland Rangers 4 – 1 at Malabar. 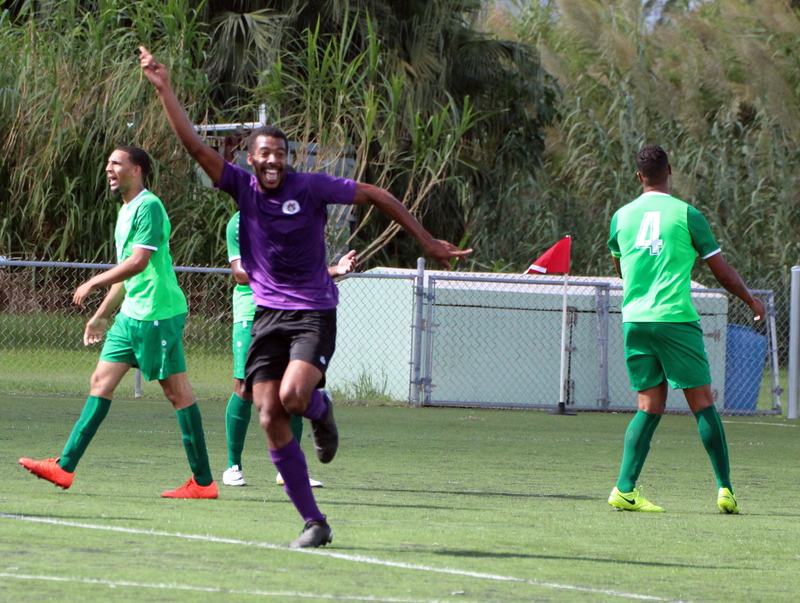 Hamilton Parish got single strikes from Shakeem Albouy, Jokai Fox, Shayne Hollis and Jermiah Steede, while Tafari Mallory scored the lone goal for Ireland Rangers. At the Wellington Oval the Southampton Rangers came away with a 1 – 0 win over the St. George’s Colts, the lone goal would come in the 59th minute from Quadir Maynard. At Lord’s in St. David’s, the host and visitors Devonshire Colts played to a 1 – 1 draw, Kyle Jones gave the Devonshire Colts the lead in the 21st minute, St. David’s drew level when Kamali Davis scored in the 52nd minute. This match at the Garrison Field was not played due to the field being unmarked.